The years when the Ardanza Reserva gains the suffix Especial are rare indeed; in living memory there have been only three; 1964, 1978 and now 2001. These are deemed, explicitly as it turns out, to be extremely special years and it should come as no surprise that the 2001, even by Ardanza’s high standards, is out-standing. As usual, this is a blend of 80% of Tempranillo and 20% of Garnacha, the latter high in comparison with the other members of the Rioja Alta portfolio, but lending the characteristic ripe and voluptuous notes which have long made this wine a favourite. The 2001 gives a little extra…extra balancing mineral acidity from the quality of the vintage and extra fine tannins from the 36 months of ageing, both adding further dimensions of excellence. Tobacco, leather and spice vie for attention with the traditional and not entirely helpful strawberry and cream descriptor, rounded of by deeper more resonant notes to underline the seriousness of intent as the plot unfolds after the early seduction scene. 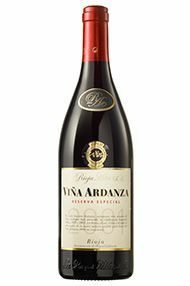 The Wine Advocate - The 2001 Vina Ardanza Reserva Especial is a blend of 80% Tempranillo and 20% Garnacha from their vineyards in Fuenmayor and Rioja Baja respectively and it represents only the third vintage to be declared after 1964 and 1973. Aged in American cask for 36 months, it has a bucolic, natural bouquet of bright red cherries, balsamic, mint and a touch of dried honey all with superb delineation. The palate is medium-bodied with wonderful delineation and supple, lithe tannins. The acidity is very well judged and it leads to a pert, tense finish of bitter cherry, loganberry and licorice. This is an outstanding wine drinking perfectly now, but it should age effortlessly. Drink now-2030. La Rioja Alta continues to be one of the benchmarks for traditionally produced Rioja wine. Established in 1890 at the same spot where their head office sits today, their three Reserva Wine brands, Alberdi, Arana and Ardanza are named after the founding families, all three of which remain shareholders. The company still maintains traditional Rioja winemaking practices whilst embracing many of the new technological advances. It is unusual for a great bodega of Rioja to own vineyards, but La Rioja Alta own 360ha from which they can source top-quality grapes, resulting in excellent fruit and richness throughout their wines. Tempranillo dominates the plantings, complemented with a small proportion of Garnacha and Graciano vines. The company is renowned for the quality of its Reservas and in particular for its Gran Reservas, the 904 and the 890. The latter are produced only in exceptional years, are amongst the finest wines being produced in Rioja today. Gran Reserva 890 is named, rather confusingly, after the date of the creation of La Rioja Alta (1890). It is the non-plus-ultra of the family, a wine that slumbers patiently for 6 years in oak, then is allowed to rest in bottle for a few more years before its released to the suspecting market-place. A high quality red wine grape that is grown all over Spain except in the hot South - it is known as Tinto Fino in Ribera del Duero, Cencibel in La Mancha and Valdepenas and Ull de Llebre in Catalonia. Its spiritual home is in Rioja and Navarra where it constitutes around 70% of most red blends. 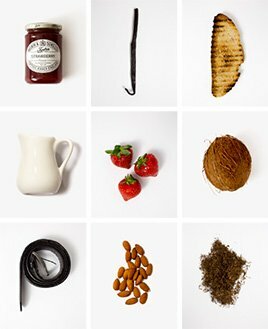 Tempranillo-based wines tend to have a spicy, herbal, tobacco-like character accompanied by ripe strawberry and red cherry fruits. It produces fresh, vibrantly fruit driven "jovenes" meant for drinking young. However Tempranillo really comes into its own when oak aged, as with the top Riojas where its flavours seem to harmonise perfectly with both French and American oak, producing rich, powerful and concentrated wines which can be extraordinarily long-lived. In Ribera del Duero it generally sees less oak - the exception being Vega Sicilia where it is blended with Cabernet Sauvignon and Merlot and then aged for an astonishing 7 years in oak and is unquestionably one of the world`s greatest wines. Rioja is known primarily for its reds although it also makes white wines from the Viura and Malvasia grapes and rosés mainly from Garnacha. Most wineries (bodegas) have their own distinct red wine formula, but are normally a combination of Tempranillo, Garnacha and sometimes Graciano. Other red varieties recently approved into the Denominación de Origen Calificada (DOCa) regulations are the little-known Maturana Tinta, Maturana Parda, and Monastel (not to be confused with Monastrell). The most important of these by far is the king of native Spanish varieties, Tempranillo, which imbues the wines with complex and concentrated fruit flavours. The Garnacha, meanwhile, bestows its wines with warm, ripe fruit and adds an alcohol punch. 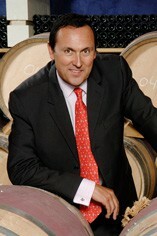 Graciano is an améliorateur grape (one that is added, often in small proportions, to add a little something to the final blend) and is found mainly in Reserva and Gran Reserva wines, albeit in small quantities (two to five percent), adding freshness and aroma, and enhancing the wines' ageing potential. Crianza wines are aged for one year in oak followed by maturation for one year in bottle before being released for sale. Reservas must undergo a minimum of three years’ ageing before release, at least one of which should be in oak casks. Finally, Gran Reservas, which are only produced in the finest vintages, must spend at least five years maturing, of which at least two must be in oak. Geographically, Rioja is divided in to three districts: Alavesa, Alta and Baja. Rioja Alavesa lies in the northwest of the La Rioja region in the Basque province of Álava. Along with Rioja Alta, it is the heartland of the Tempranillo grape. Rioja Alta, to the north-west and south of the Ebro River in the province of La Rioja, stretches as far as the city of Logroño. Elegance and poise is the hallmark of wines made here with Rioja Alta Tempranillo. Mazuelo (Carignan) is occasionally added to wines from this area to provide tannins and colour. Rioja Baja, located to the south-east, is the hottest of the three districts and specialises in Garnacha. Rioja has witnessed a broad stylistic evolution over the years. The classic Riojas pioneered by Murrieta and Riscal in the 19thcentury were distinguished by long oak-barrel-ageing whereas the modern style, represented by Marqués de Cáceres since 1970, showcases the fruit and freshness of Tempranillo, keeping oak ageing to the legal minimum. The post-modern school that emerged in the late 1990s from producers like Palacios Remondo and Finca Allende concentrate on making wines from old vines or specific vineyard plots to accentuate the terroir, and using larger proportions of minority varietals such as Graciano. The alta expression wines, pioneered by Finca Allende (among others) and later taken up by almost every other producer in Rioja, represent the newest flagship category in Rioja. Alongside the traditional Gran Reservas, alta expression wines are limited production and come from low-yielding vines, often from a single vineyard, and are hand-picked. Excellent examples of this style are Artadi's Pagos Viejos and El Pison. However, modernisation has not held back the continuation of successful traditional styles as well. Happily long-established houses such La Rioja Alta, CVNE and Marques de Vargas continue to make graceful, old style wines better than ever before. White Rioja is typically produced by the Viura grape which must comprise at least 51 percent of the blend; the rest can be made up by other, recently-authorised varieties, namely Sauvignon Blanc, Chardonnay and Verdejo, as well as the native Maturana Blanca, Tempranillo Blanco, and Turruntés (not to be mistaken for Torrontés). Finca Allende, Amezola de la Mora, Artadi, CVNE, Marqués de Vargas, Palacios Remondo, La Rioja Alta, Murrieta.